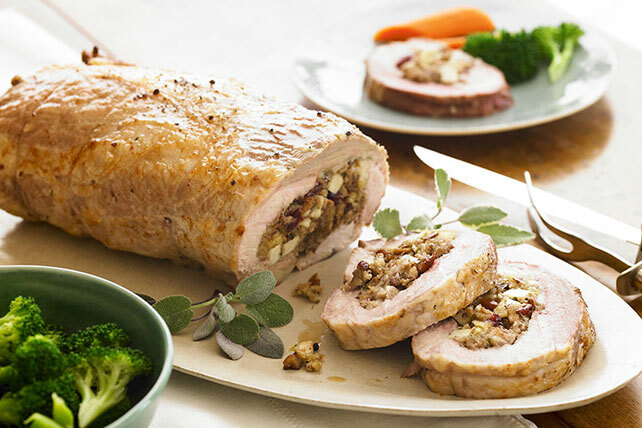 Get ready for dinnertime with Harvest Stuffed Pork Loin. A short prep time, plus apples, cranberries, pecans and sage, make this stuffed pork loin impressive for your family or a table full of guests. Try Harvest Stuffed Pork Loin tonight. Prepare stuffing as directed on package. Remove from heat; gently stir in fruit, nuts and sage. Open meat; place cut-sides up, on work surface. Top with stuffing; roll up, starting at one long side. Place, seam-side down, on foil-covered baking sheet sprayed with cooking spray. Season with salt and pepper. Bake 45 min. or until meat is done (160ºF). Let stand 10 min. before slicing. Serve with hot steamed vegetables, such as carrots and broccoli. Substitute raisins or dried apricots for the cranberries.